When our oldest son was born there were complications. I remember seeing the doctor and nurses hovering over his body. I remember being impressed at how broad his chest was. I didn’t worry about him. In fact, I thought he would grow up to be a linebacker. Instead he grew up to become a brilliant musician, artist and handyman, a kind of modern day Leonardo da Vinci. Most importantly, he lives a pure life dedicated to God and his family. I praise God over his birth. But the greatest birth in history is Jesus’. Although he was always with God and was God, yet in the Bethlehem event he became flesh and dwelt among us (John 1). He did so in order to crucify our sins and our sinful nature. He was raised in order to enter our lives and live through us forever. But one of his tasks was to be a role model for us as to how to live. He lived in total dependence on the Father (John 5:30). Likewise we should live in total dependence on him (John 20:21). Jesus’ birth changed the course of history. Thus we have B.C. (Before Christ) and A.D. (Anno Domini, year of our Lord). Scholars have changed this to B.C.E. (Before Common Era) and C.E. (Common Era), but it still turns on the coming of Christ. Try as people might, they can’t erase the fact that Jesus changes everything! However, we need to make sure Jesus changes us! Let him come into your life and let him fill you with his Spirit. Learn to live in total dependence on him. Then you will truly praise him as did the angels and shepherds in that great Bethlehem event. Sunday I’m preaching on “Praise God over the Birth” from Luke 2:1-20. 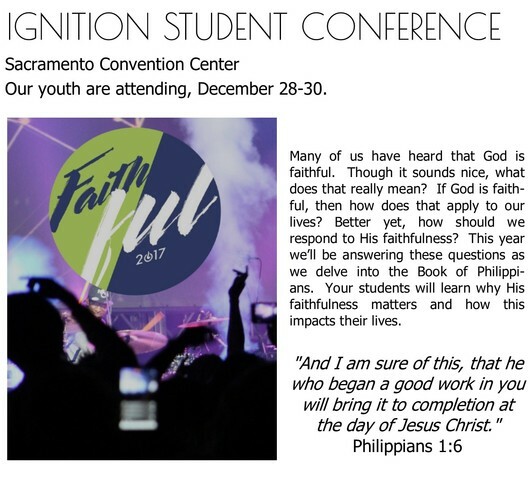 We had a wonderful Business Meeting last Sunday night wherein we voted to commission Cheyenne Rienks to be our paid part-time Assistant to the Pastor and Greg Horton to be our paid part-time Youth Director. We’ll have a going away party for our Assistant Pastor James McKenzie during our end of year potluck Dec. 31, at noon. Please bring lots of food as we honor this great friend and staff member. Don’t forget that this Sunday we have Sunday School for all ages at 9:00 and worship at 10:30. 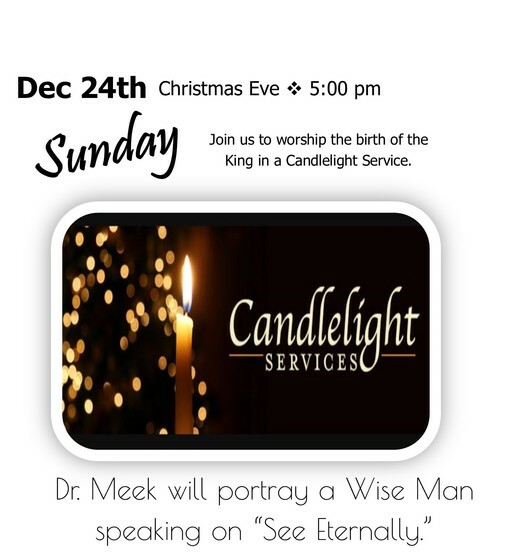 Then, at 5:00 pm is our Christmas Eve Candlelight Service. I’ll portray a Wise Man in beard and costume with the message, “See Eternally.” Please invite family, friends and strangers to these events. NO CHURCH ACTIVITIES ON WEDNESDAY, DECEMBER 27TH.